I start the writing for this month (March) from a cabin I am sharing with my father and father-in-law at Calamus Outfitters located on the Switzer Ranch near Burwell, Nebraska. We are just past the middle of a 10-day road trip that is the celebratory gift Janelle gave me on the occasion of my 40th birthday, which occurred exactly 6 months ago yesterday (9/29)! I know, I know, happy birthday to me. I got sung to by the other guests at dinner last night. They even made a feeble attempt at harmony! I was the youngest person in the room, a situation that suits me well, especially when I am in a reflective mood. Peers can be distracting. We are in Burwell to see prairie grouse—the Sharp-tailed Grouse and the Greater Prairie Chicken—as they perform their yearly collective pre-mating ritual at their special stomping grounds (literally) known as leks. The ritual involves lots of noises and motions on the part of the male grouse that seem rather silly to us, but which clearly are of great assistance to the lady grouse in deciding with whom to mate. They are all so occupied with this that humans seeking to look in on their business can do so from blinds located quite near the leks. 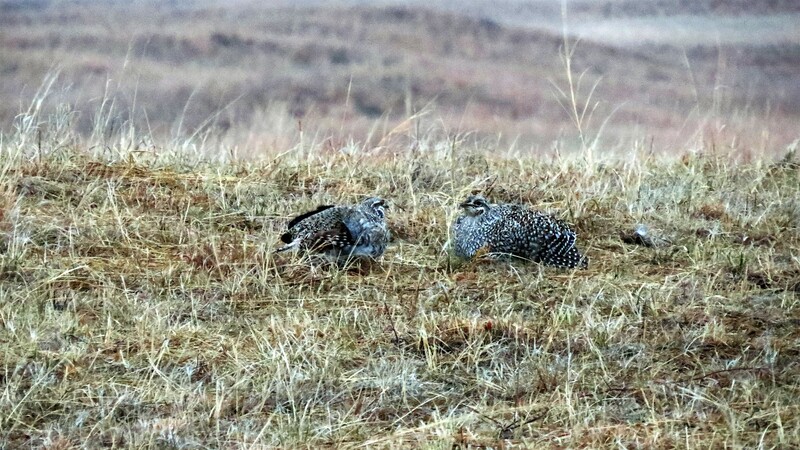 This morning as dawn was almost breaking we snuck into old broken-down school buses with windows removed and watched in amused wonder as the Sharp-tailed Grouse flew in, then strutted their stuff while light came to the prairie. We will do the same for the Greater Prairie Chicken tomorrow, to our delight I am sure. 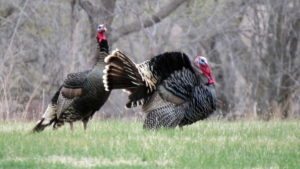 As entertaining as this is, and as beautiful as the birds are, this is not the primary reason we are in the Great Plains. 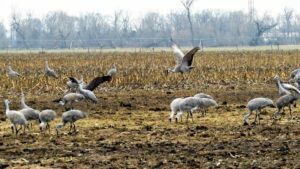 Janelle’s idea for this trip came as a response to one of the few items on my “bucket list,” which was to witness the migration stopover of the Sandhill Cranes on the Platte River in central Nebraska. 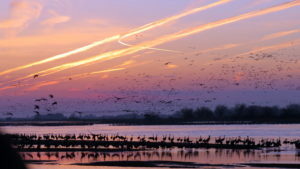 Up to 500,000 cranes pass through there in any given year on their way from wintering grounds in Texas and Mexico to their breeding grounds in the upper Midwest through Canada and the Arctic. For millennia, the Platte River valley has offered them respite from the grueling journey, and their life cycle relies on stopping for a month or more, depending on weather conditions, to rebuild energy reserves before heading on. I have always been fascinated with biological spectacles, especially migratory (how well I remember sitting for an hour or more on the lawn and watching the ribbons of migrating grackles passing thirty or fifty feet overhead and stretching as far as I could see in both directions), so as I have heard about this one over the last several years I have developed a desire to be here when it happens. I guess I mentioned it often enough that Janelle took me seriously! I am very grateful. Part of my desire also stems from something like whimsy, since I used to have a recurring dream of large, fantastical, heavily plumed birds on migration descending from the sky into my parents’ yard. We would converse together, the birds and I, though I don’t remember anything we talked about (They were kind enough, but a bit aloof, as I recall). This crane thing in Nebraska seemed the best match to experiencing in waking time a dream I had savored. On all counts, the cranes exceeded my hopes for the experience. No, they didn’t match the birds in my dream…but let’s not get picky. Anyway where would you hope to find hordes of flamingo-headed birds with fine ostrich-like plumes descending feet-first from the sky like ballerinas with the fluttering of their dainty wings, their knowing looks casting my terrestrial nature into pathetic light? In a way, the speech of the Sandhills accomplished the same message more eloquently and efficiently: their staccato bugles in flight and rolling chuckles on their sandbar roosting sites made quite clear that I am a stranger in their world; a world in which standing all night in a chilly wind with your feet in a snow-melt river means rest for your journey, and in which your home is as much in the sky as it is on the ground. I am sure my dream played into it, but I felt chills in my spine when a crane coming in to land would drop its legs down, pull its head up and set its wings for descent, as if it would stand on the air. The first evening as we waited in the blinds along the river and the cranes flew in, we experienced a satisfied wonder. This was what we had come for! And then they kept coming. And coming. In from the fields where they were foraging all day to the relative night safety of numbers and a ready-made warning system in the form of a water barrier between them and the terrestrial predators. As the horizon heaved up towards the sun and color filled the western sky, the trickle of cranes became a current, skein after bowed skein flowing in like collapsed waves coursing up a beach in slow motion. Looking upriver into the sunset through binoculars revealed miles of such waves, each wobbly fleck of silhouette an individual like the tall and elegant bird standing with its peers in the shallows of the sandbar in front of me, each needing to find a place to stand and rest, each on a journey to seek out a place to hatch and feed its young. Life pulsating its way over such dimensions…what can prepare you for this? And the exhilaration of watching them, the next morning, launch themselves noisily into the air (just a small taste included here) in increasingly large groups until at one moment by some accumulated or communicated signal, the bulk of them on our stretch of river leaped up and grabbed onto the air all at one moment with those agile wings and lifted themselves up, up, up and outward in a joymaking spectacle that had the humans in the blind catching their breath and scrambling for their electronic recording devices, eyes moist. 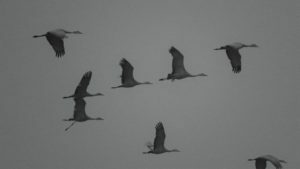 The cranes’ raucous calling resounding in our ears (it still is), the flock climbed upward into the sky and drifted away like firework smoke to their favorite foraging spots beyond our sight. We beamed into each other’s faces and exclaimed in whispers about the moment we had just passed through together with something like reverence for the oldest known surviving species of bird. Our admiration was utterly lost on the cranes. They are enough for themselves. Or are they? No organism in this world can exist without its relationships to other organisms, with the possible exception of some thermal vent bacteria or other mineral-feeding, heat-driven microbes. The cranes are very old…though individuals in the wild don’t last more than 25 years or so, as a species they have seen not only civilizations, not only other species, but even perhaps the very rivers come, go, and change form. It is tempting to think of this as a form of biological aloofness; an untouchability or even invincibility. I suspect that it is rather a testament to their adaptability and fitness, developed over thousands of long millennia of selection pressure, for a wide variety of circumstances. But what it does not imply is independence. Each species in its form and function implies interdependence within an ecosystem: a bioregional community to belong to. The human is the species for which this might be thought to be in question. We have made quite some specialty out of divorcing ourselves from the need for a specific bioregion or environment in order to thrive. But again, looks can be deceiving. We have made little progress in divorcing ourselves from our need for functional relationships to other species (we can’t live on Mars as is), but we have made astonishing strides when it comes to adaptability. Another way to say this is that in our pre-agricultural form we have needed vibrant ecosystems as much as any species ever has, it’s just that it has become more or less irrelevant exactly which ecosystems, since—and this is our great evolutionary leap—we are adapted for mediating our dependence relationships by way of culture and learning, not by way of instinct. Actually, that is not quite correct. We do use our instincts, but our instincts are honed specifically for the development of culture, which is how we survive everywhere. Upon close examination, we find that to some extent culture can be credited to many of our fellow animals (maybe even some plants, but let’s not get too far afield here). Elephants and cetaceans (whales, porpoises, dolphins) are prime examples of groups for which culture plays a huge role in survival success. The human distinctive is one of degree, not kind. 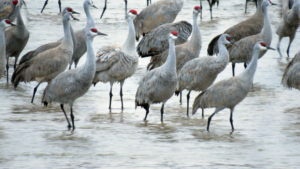 Look at cranes…there are groups that have given up migrating and live in Florida year-round. The species is not totally locked in to the prevailing pattern. I think it’s useful now to highlight something the observant might already have picked up. As the cranes fly out to forage each morning, they forage in fields, by which I mean agricultural fields (mostly corn and soy) and cattle pastures. 60% of their diet on these annual stopovers is one food: gleaned waste corn from monocultures, of which the total population is said to consume 1,600 tons annually. Why is this ancient wild bird eating modern corn? The answer is simple and two-fold: because their old foods are too diminished, and because it’s there. This ancient bird, it turns out, is happily omnivorous and likes corn rather well. 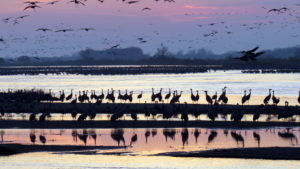 In fact, given the changes in the Platte River Valley due to intensive management of the Platte river for irrigation, municipal, and industrial interests as well as conversion of land for agriculture, it is likely that without the corn available the cranes would not find enough food to bulk up satisfactorily for their journey north, and the species could suffer declines. Furthermore, the changes in seasonal river flow have disrupted natural flooding cycles that keep sandbars in the river cleared of shrubs and trees—clear sandbars being critical crane roosting features—such that conservationists have taken to using heavy machinery to clear the resurgent vegetation artificially. Think of the implications of this if you will: Because of our interference in their ecosystem, they now depend on us for support. This is a perfect example of the Permaculture concept “Burden to the Intervenor.” I don’t know if this feels heavy to you, but it sure does to me. Is this a burden we want to keep carrying? Is this a burden we will indefinitely be able to carry? To borrow from the old gospel song: How, I wonder, does one lay such a burden down by the riverside? What else might we have to lay down? Into what new life would we be baptized? …I am writing now from a hotel room near St. Louis, Missouri, the next stop on our road trip. We planned to stop somewhere around here to break up the long drive into manageable hunks, and chose St. Louis so we could find an established population of exotic Eurasian Tree Sparrows in a city park, and so we (o.k, I) could visit the City Museum, which my dear and well-traveled friend Adam (a Missouri national himself…we visited him on the way out, but that’s another story) regards as one of the wonders of our continent if not the world, and which my brother-in-law Mark briefly highlighted in the film YERT: Your Environmental Road Trip. Theirs are two of several dependable recommendations. The riot of crane calls and the sounds of the Sharp-tailed Grouse are now joined in the ear of my imagination and memory by the whoops and booms and cackles of the Greater Prairie Chicken, male members of which honorable species put on a real show for a few females that looked like they couldn’t care less (but didn’t leave either, so take heart, fellas). 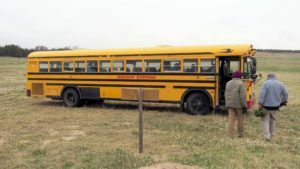 A gaggle of us bird nerds watched in glee from some decrepit school buses parked nearby. It was so much fun! Prairie chickens are a species that is, as its name implies, tightly entwined with its prairie ecosystem. I would have to say that it seems to me less flexible than the cranes in that regard. Some tiny percentage of the original prairie remains, and the same is true of the chickens. Some of the best intact prairie is found on ranches in the Sand Hills of Nebraska, and it is working prairie. That is to say cattle graze it under the attentive care of the ranch owners. It is a starkly fragile sod; early European settlers soon learned not to take a plow to any but the richest of its bottomlands lest it return to its ancient form: drifting sand. Overgrazing it is almost as perilous; the area’s ranchers fear little more than they do bringing damage to those precious acres of prairie plants. At Calamus Outfitters, we were exposed to the conundrum these lands, and their iconic chickens, now face. Prior to the arrival of European settlers it was the grazing action of bison and elk, combined with the work of dung beetles (not to mention the vast array of other species in the complex) and effects of lightning- and human-kindled grass fires that maintained the treeless and diverse plant communities that thrived here. The prairie chickens thrived with them, existing in hordes that settlers claimed “darkened the skies” and were found “swarming” over the hills. It sometimes seems to me early settlers were a tad prone to hyperbole with such things, but the point is made: there were a lot of prairie chickens. In less fragile soils, where prairies have typically been converted to grain production, the birds are gone now. On well-maintained cattle ranches, they hang on, but do not darken skies or swarm. 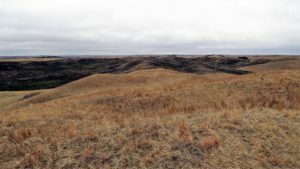 When ranchers have had to abandon land or have been unable to groom it with tools or fire (in fact, fire has usually been actively suppressed for reasons our culture thinks are obvious), introduced and native local tree species begin to establish in the open areas, providing potential perches for raptors; the grouse and prairie chicken hens instinctively avoid nesting near a perch, so unless the land stays in open prairie, the birds rapidly decline and disappear. 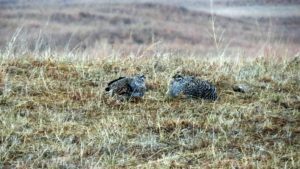 So keeping the ranches functioning and healthy is crucial for keeping prairie chickens. Like the cranes, it won’t do to leave them alone, given prevailing land use patterns. 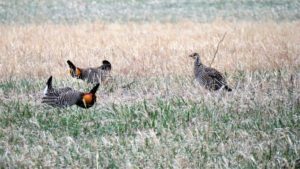 But perhaps unlike the crane situation, in the case of the prairie chickens the paradox is nested in a bit more of a complete system, at least on Switzer ranch. 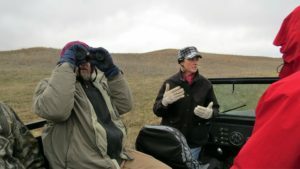 Whereas the crane conservation efforts are headed up by nonprofit foundations entrusted with crane protection and promotion that seek to maintain benign or even mutually beneficial relationships with local grain producers and water regulators, the prairie grouse habitat on Switzer ranch is actively and purposely maintained by the ranching family itself, because through ecotourism they have found a way to turn a natural byproduct of their ranching system—a semblance of ecological integrity—into a source of income. Badly needed income, I might add. Few ranching families are able to make a realistic income from ranching alone these days (the same story as nearly every other sector of family farming), so ranchers are hanging on as precariously as the charming chickens that sometimes populate their beloved acres of prairie. 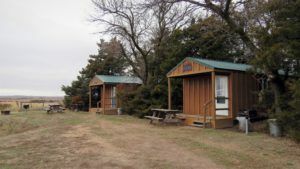 This reality is not lost on the World Wildlife Fund and the Nature Conservancy, both of which have partnered with the Switzer family on habitat projects on the ranch. It might be happenstance in this case that what is good for the ranch is what is good for conservation. Certainly human uses of land or other ecosystem interventions (over-hunting comes to mind) conflicting with the needs of native species would seem, if conservation organizations’ literature is to be believed, to be more the norm. But I have my doubts about that way of thinking (I was getting some fun out of asking in otherwise polite conversation around meals which was the better conservationist, the hunter or the birder) and I maintain hope that models like the Switzer ranch, while surely not perfect for the ranchers or the conservationists, represent a microcosm of how we might begin to change our thinking about human involvement in ecosystems. We might learn, if we pay attention, to extract principles from this scenario that could be used to rethink the resource use conundrums that give us such a collective headache. Eventually I would like to see us push ourselves to think even more flexibly about these issues. Here are two examples to support what I have in mind: First, the case of the Alewives. I don’t know much about Alewives, but I recently read enough about them to get excited. Alewives are migratory fish along the lines, ecologically, of salmon or ocean-run shad or trout species. They ascend rivers at a certain time of year to lay eggs in spawning grounds under small streams. Eggs hatch, fry descend to the estuaries and oceans to grow to adulthood, and the story is repeated ad infinitum, assuming nobody blocks the river or stream with a giant wall of concrete. Oops…Dam! Rivers in the Northeast used to abound with Alewives during the spawning runs. On the river I read about (I think it was the Connecticut), the yearly estimate had fallen to 10,000 individuals. Observing this decline and also noticing that many of the dams were old and no longer purposeful, someone got the brainy idea to convince all interested parties to remove them. They did it. No other changes were made, so far as I remember reading. In a few years the estimates of spawning Alewife in the rivers had increased to 1.5 million. That’s 150 fish now for every 1 before. Impressed? The second example also comes from fishery rehabilitation, this time full-time saltwater. I don’t remember the species involved or the location. I believe it was a tropical situation. What I remember was that the indigenous population of a given island nation or region had grown and I think they had also commercialized the fishing of their local species enough that they had collapsed the fishery and one or more species were threatened with extinction. It was a desperate situation for fish, fisherfolk, and conservationists. One way or another, the humans involved were able to agree to the plan that a minor percentage of the formerly abundant, now nearly exhausted fishing waters would be placed off limits to fishing, whereas the rest would be fished as usual. Within a short time (I think under five years), the young produced in the protected area had generously populated the depleted waters, and the fishery returned to productivity not seen in a long time. Impressed again? Each of these scenarios had its own limiting factors, its own ecology, and its own human society in place. The strategies, therefore, were uniquely tailored. But the basic idea that studying a given situation of former abundance now suffering decline and finding the little tweaks that might allow it to resurge is anything but unique. In fact, in terms of engendering abundance in our surrounds, I would like to suggest that there is no technically easier approach, though politics and culture present other challenges. 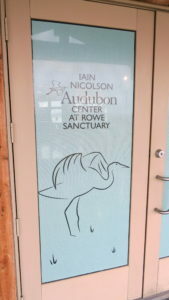 But just imagine with me for a moment: What would happen in the case of the cranes or the prairie chickens or others if we tweaked things to favor abundance of what is already adapted to the environments we populate, the lands we use? What surfeits of life would emerge? Could we eventually induce wild populations of such species to increase so much that harvest and consumption of a carefully monitored and chosen percentage would be practical? Like grizzlies pulling salmon loaded with roe from an Alaskan stream, we need not experience taking what we need as a moral trespass, if we do so as mutual and integrated ecological partners. Take notice with me of the power of this continent, this Turtle Island to produce flows of life that stagger the mind, be they passenger pigeons, bison, or corn. And take further notice of the power of humans to craft situations that remove obstacles to abundance. Could we turn our attention to cooperating with the natural order on this? If we got really good at catalyzing the thriving of our ecosystems, what power would we unleash? I think our imagination is the limiting factor. …Back at the Super 8 in O’Fallon (an outlying town in the greater St. Louis area), we’ve got another day of birding adventures under our belts, plus that visit to the City Museum. 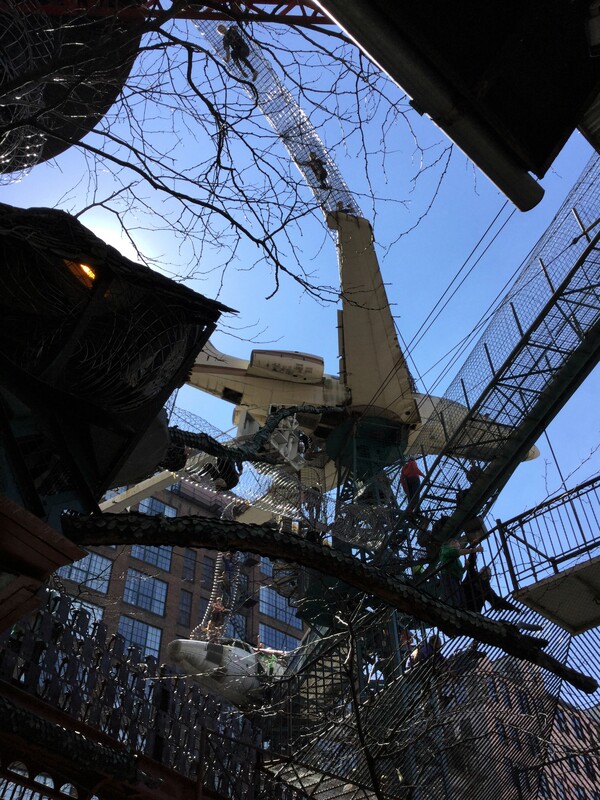 As an aside, do visit the City Museum if you can, it is a phenomenon of human ingenuity and love. But three pieces of advice: Dress lightly to avoid claustrophobia, try to visit on a weekday if you don’t want long lines for the hugely inventive slides, and if you are over forty bring a kid with you so you have an excuse to do all the stuff; a way to trick your stodgified mind into enjoying it fully. The birding adventures consisted of a visit to a St. Louis area park along the Mississippi to find the not-very-elusive Eurasian Tree Sparrow (another tick on the life list…check! ), and a few hours finding what we could at a series of marshes near the river, accompanied by an expert volunteer guide found through BirdingPal.org. We tooled around the wetland, parking on the gravel roads a few places and strolling along paths in the marshes, pulling our binoculars up to find birds, birds, birds. And then more birds, birds, birds (also a beaver). We had not planned on another spectacle, but we got it. Hundreds of White Pelicans kettling and flocking overhead; over a thousand American Coots in one spot; Shovelers in the hundreds; two kinds of Teal; Gadwall; Grebes; Marsh, Song and Fox Sparrows; Harriers; Harlan’s Redtail Hawk (plus the regular kind); Bald Eagles; Yellowlegs, Greater and Lesser; Grackles; Rusty Blackbirds; Robins; Cardinals; Killdeer; and my favorite—a solitary Trumpeter Swan finding his lunch. At one point we walked past an industrial-looking installation of huge pipes and valves. Knowing this was a protected area, my suspicions were raised that we had stumbled onto another example of what I am talking about. I asked our guide. Yes, this is all former farmland that was damaged for cropping by sand deposits after some floods in the nineties, such that the farmers became willing to sell it to the Missouri state conservation service which manages it carefully for—you guessed it—duck hunting. Which brings up an interesting point. Am I not simply suggesting something that the fish and game departments of all the states have been doing for decades now? Why, yes, I think I am, more or less, and it’s been “wildly” successful for several key species (white-tailed deer, wild turkey, black bear come to mind). I never said I was reinventing anything, though I would like to advocate for a much more thoroughgoing engagement that tends to blur the distinctions between promoting wild species and agricultural endeavors. One of our chief tasks now, in my view, is to bring ourselves up to speed on the ways in which we as individuals, as a culture, society, even civilization may already be engaged in parts of this process and then throw our support behind those programs, businesses and efforts, and bring awareness to them. That is to say, go visit your conservation areas, attend those public meetings, read that literature, patronize that integrative farmer, dust off those binoculars, turn over some rocks, sit a while in a place, let your kids run a little wilder. Be a part of the current of humans coming home to roost in the places we belong, our toes in the free water, with each other for raucous companions.